1 Mayflower Descendant: A Journal of Pilgrim Genealogy and History, Boston: New England Historic Genealogical Society, 2017, Vol. 65, No. 1, p. 83. 2 U.S., Sons of the American Revolution Membership Applications, 1889-1970, Membership application for Howard Homan Buffett, 03 DEC 1947, Ancestry.com (Online Database). 3 Schroeder, Alice, The Snowball: Warren Buffett and the Business of Life, New York, New York: Bantam Books (2008). 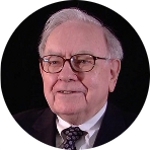 4 Wikipedia, "Warren Buffett", (accessed 02/18/2012).